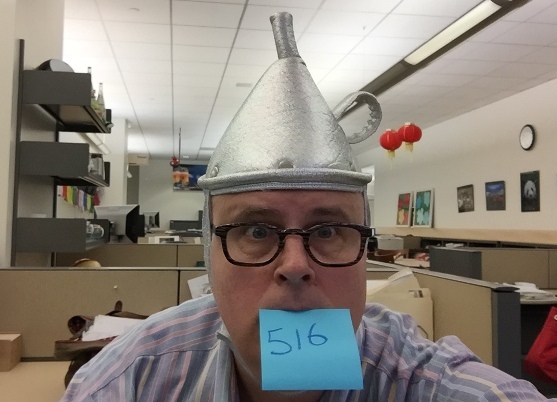 In celebration of Millinery Monday I present a silver metallic, funnel-shaped Tin Woodman hat with Velcro-closure, under-the-chin strap and metal stud detailing around the edge. Interior tag reads: "Pony Express Creations, Inc" and "Made in China" along with the no-longer-valid web address of the manufacturer. Clearly a nod to the headgear worn by the heart-seeking metal lumberjack from Frank L. Baum's "Oz" books, this from the cornucopia of caps left at my cubicle by Davis Alexander (see PC: 513 --"A 'Mingo for the Moms") and was part of her hat-collecting mother's deep bench of lids. Today's hat-tip goes to Alice Blue Nadler, the assist to Davis Alexander.